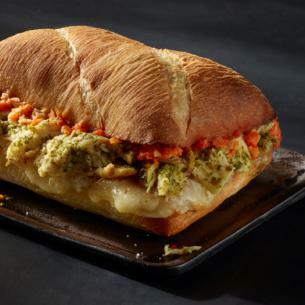 Shredded chicken breast is tossed in a tantalizing chimichurri sauce, topped with shaved Manchego cheese and a red pepper-almond spread on a soft ciabatta roll. A captivating combination. Our chickens are raised without use of antibiotics. california focaccia roll (enriched wheat flour [wheat flour, niacin, reduced iron, thiamine mononitrate, riboflavin, folic acid], water, extra virgin olive oil, salt, sour starter [wheat flour, cultured wheat flour, yeast, lactic acid (from bacterial culture)], malted barley flour, yeast, enzymes), chimichurri chicken (shredded herb white meat chicken [white meat chicken, water, seasoning (dehydrated garlic, dehydrated onion, spices, sugar, paprika), salt, vinegar, seasoning (chicken broth powder, chicken powder, onion powder, natural flavor), dextrose, sunflower/soybean oil, sodium phosphate, spice extractives], chimichurri verde sauce [canola/olive oil blend, onions, parsley, cilantro, garlic, salt, jalapenos, lime juice, thyme, red wine vinegar, red peppers, black pepper and citric acid]), romesco sauce (roasted red bell pepper puree, tomatoes in tomato puree [with salt], ground sesame seeds, almonds, lemon juice, garlic, red wine vinegar, natural flavor, canola oil, salt, extra virgin olive oil, spice, xanthan gum), manchego cheese (pasteurized sheep’s milk, salt, cheese cultures, rennet). may contain: egg.